, an eminent Italian scholar, was born at Bologna in 1488, of a noble family. In his studies he made uncommon proficiency, and had distinguished | himself at the early age of twenty by his very learned work on Plautus. According to the custom of the age, he attached himself to various princes, but at first to the celebrated Albert Pio, count of Carpi. Having become imperial orator at the court of Rome, he obtained by his talents and knowledge of business, the titles of chevalier and count Palatine, and was intrusted with some important functions, such as that of bestowing the degree of doctor, of creating notaries, and even legitimizing natural children. At Bologna he was professor of Greek and Latin, rhetoric and poetry, and was chosen one of the Auziani in 1522. 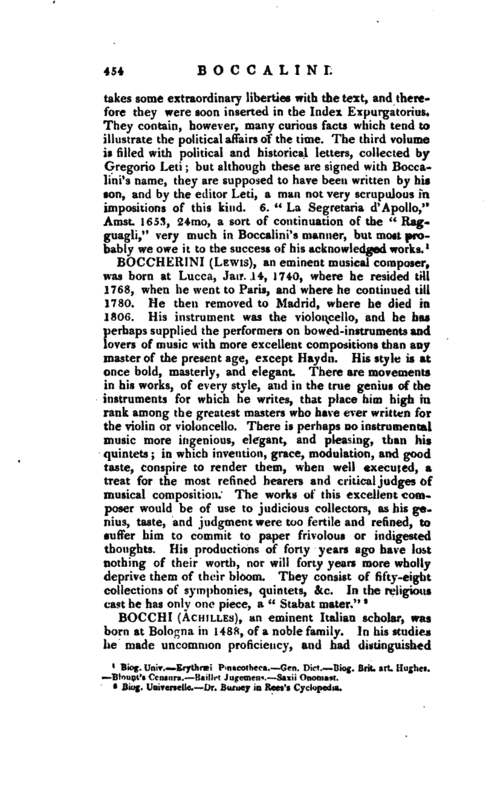 Having acquired a handsome fortune, he built a palace, and in 1546 founded an academy in it, named from himself Academia Bocchiana, or Bocchiale. It was also called Ermatena, agreeable to its device, on which was engraven the two figures of Mercury and Minerva. He also established a printing-office in his house, and he and his academicians employed themselves in correcting the many beautiful editions which they printed. 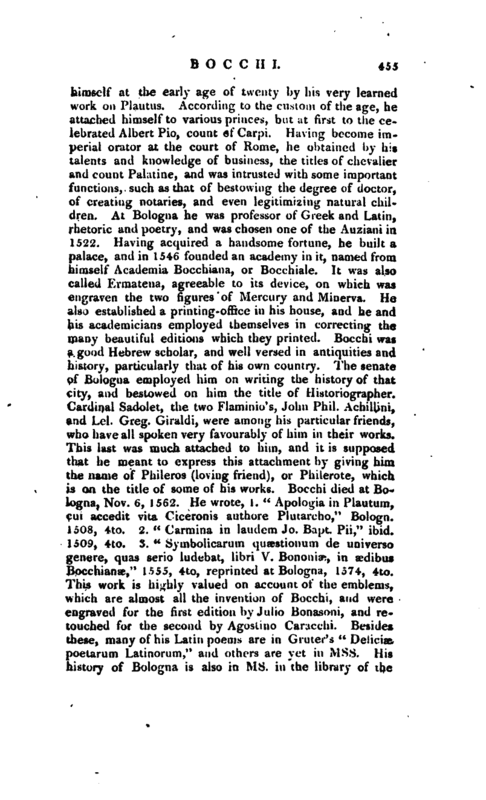 Bocchi was a good Hebrew scholar, and well versed in antiquities and history, particularly that of his own country. The senate of Bologna employed him on writing the history of that city, and bestowed on him the title of Historiographer. Cardinal Sadolet, the two Flaminio’s, John Phil. Achillini, and Lcl. Greg. 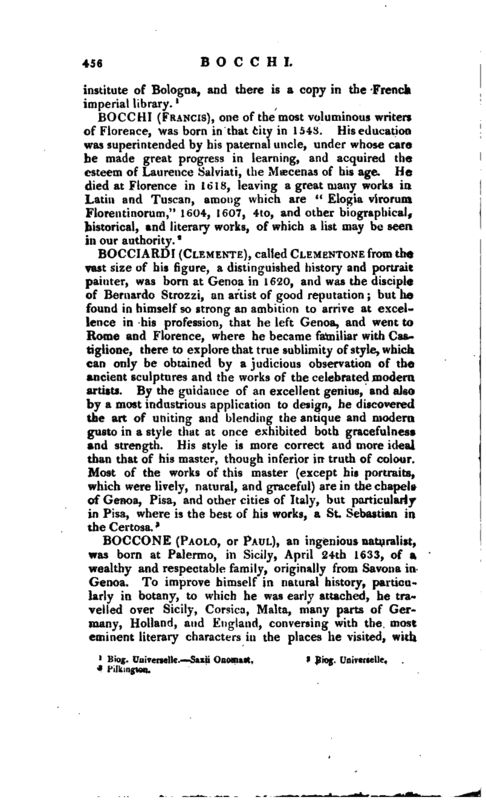 Giraldi, were among his particular friends, who have all spoken very favourably of him in their works. This last was much attached to him, and it is supposed that he meant to express this attachment by giving him the name of Phileros (loving friend), or Philerote, which is on the title of some of his works. Bocchi died at Bologna, Nov. 6, 1562. He wrote, 1. “Apologia in Plautum, cui accedit vita Ciceronis authore Plutarcho,” Bologn. 1508, 4to. 2. “Carmina in laudem Jo. Bapt. Pii,” ibid.